The plans are DONE! Mike at MPR Architecture did a phenomenal job of turning my drawings into the perfect plans for my dream house. You can read more about that here. 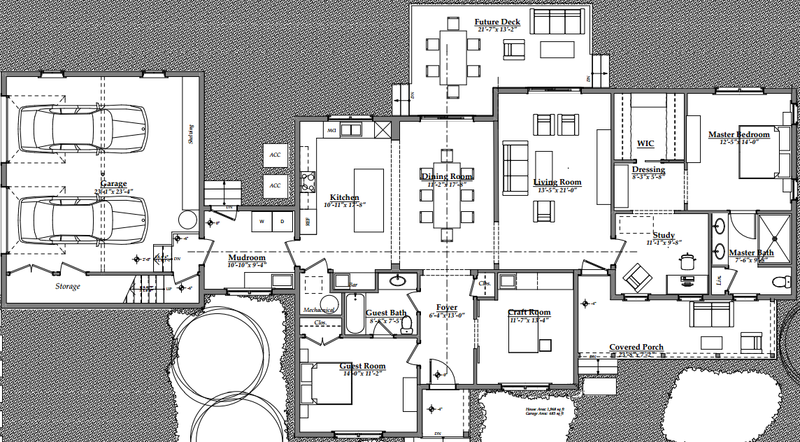 Click on the picture below to see a larger image of the floor plan, or click here to open a PDF version that you can zoom in on. A few tweaks have been made to the plan, and this is the final version that’s going to my architect as his starting point (read more about that here)… Click on the image below to open a PDF version that’s easier to view. So what exactly is this house I’m building going to look like? At this point, I have certain elements of the design figured out, but there’s still a lot to do. You can also open this PDF version. There will be some changes. I’ve already described some of those changes here and here. Also, my amateur plans are now in the hands of a competent professional. My architect friend Mike will be taking my drawing and making some tweaks and turning my “plans” into actual plans. I’ll share the final version on this page once they’re ready. In addition to improving the floor plan, Mike’s scope of work includes exterior design. I feel pretty confident with interior design, but exteriors are another story. I’ve tasked Mike with designing the roof line and exterior features to create a cottage look. I can’t wait to see what he comes up with! My plans also include a garage attached at the laundry room with an apartment on the second floor. I’m 99% sure I won’t be able to afford finishing out the garage apartment with the initial build, so I’ll share those plans some other time. Stay tuned!